SO one of my favorite meals from being a kid is Shepard's Pie. it has many ways to add more veggies to it! are using frozen meat and don't want to defrost it - put the meat in the pan first and break it up then add in the onion and celery). 10. Add the bullion to the boiling water (or heat the stock) and then whisk in the flour until mixed well and not clumpy. 11. Add the flower, and stock mixture to the frying pan. Stir well and bring the mixture to a boil. Then reduce the heat and let simmer until it is a very thick gravy like sauce. 12. 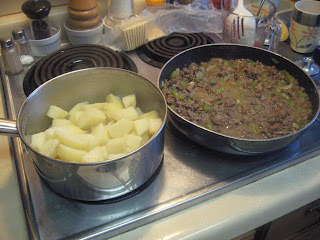 Once the meat mixture is simmering (or before if necessary) check the potatoes and once they are soft, drain them. 13. 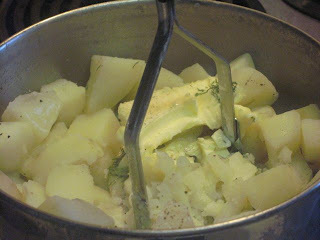 Add some butter, salt, pepper and milk to the potatoes and mash. You don't want the mixture to be too soft - you want it a little bit on the dry side as they will get softer from the moisture during cooking. 14. 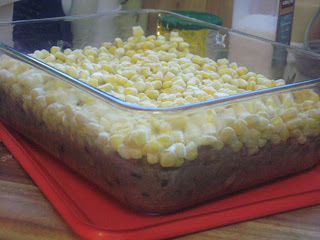 Once the meat mixture and potatoes are ready place the meat mixture in the bottom of a glass pan (I use a lasagna pan 8x11 I think) and then put the frozen veggies on top of that. 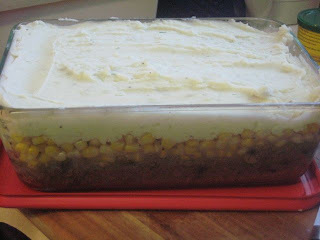 Then layer with the mashed potatoes. 15. I then add a little bit of pepper to the top. 16. Pop in the oven for 50 minutes and serve! TIPS for freezing: potatoes usually never freeze well (or so I'm told). I have frozen them when preparing for my daughter to be born and found that the best way to have them hold up is cook them a little harder then normal and then if making something like mashed potatoes keep the mixture much dryer than you normally would. Then when reheating you can add a little butter or milk ontop and they will get a nice texture. Alternatively you can also make a cauliflower puree to go on the top of this to keep it healthier. 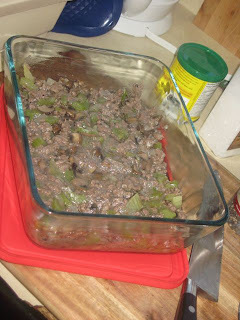 Also you can add more veggies to the meat mixture - like mushrooms, green pepper, diced carrots. The key is to keep them on the smaller size (think the size of a kernel of corn or smaller). Lastly, if you don't know how to make mashed potatoes let me know and I'll actually measure what I use and then post the directions on here! Totally reminds me of our life in early summer.. haha..gotta make it sometime soon!